On this page, metal gear refers to powdered and machining metal gear. Several types of refractory metals and their compounds, pseudo-alloy, porous materials are suitable for a powder metallurgy process. This process allows pressing the material into the final shape without mechanical processing. The loss of metal during production is only 1 to 5 percent. It saves both cost and energy. It is possible to produce high-purity materials as the sintering process is carried out in a vacuum or a reducing atmosphere devoid of oxygen or pollution. 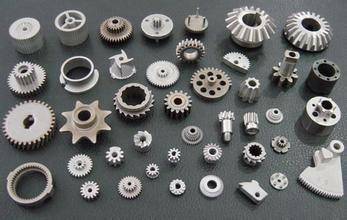 Powder metallurgy process makes sure that the composition of the material is accurate and uniform. This process is perfect for the large scale manufacturing of single mould products. In short, compared to machining, the powdered metal process is efficient when it comes to cost, materials, and energy. If you don’t need extremely high accuracy metal gears, powder metal gears are the best fit for your requirements. Power Jack Motion offers a variety of powdered metal gears including spur gears, bevel gears, internal gears and helical gears. To meet your high precision motion control applications, we have developed a unique machining technology. Following images of our local factory floor will provide you with some idea about the metal gears manufactured by us.